... finding a hoard of old bakelite knitting needles going for a song in a second-hand shop. The other morning, as I was racing to the station, something caught my eye in one of the charity shop windows. I was late (as usual) and in a terrible rush, so I couldn't stop for a better look, but I kept thinking about it all day, hoping that it would still be there at home-time. 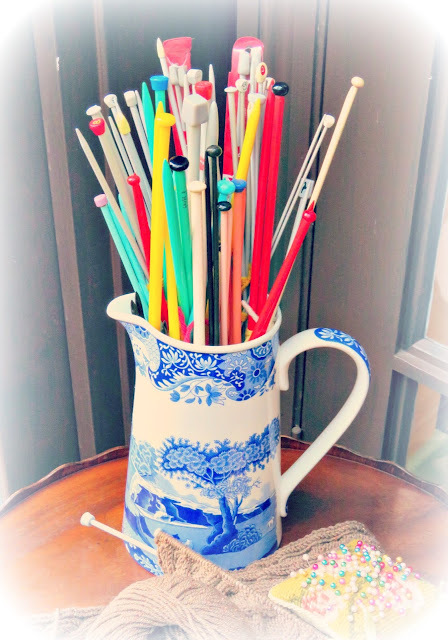 And happily it was: a consignment of old knitting needles. There are loads of brightly coloured bakelite needles from the '40's and 50's that lift my spirits every time I look at them. In fact I thought they were so wonderful I put them in a flower jug and displayed them on a side table. My son, Emi, (age 9) was not impressed when he came home from school. Weird, Mum. They look a bit weird like that. Maybe you could find a nice box for them somewhere, he said in that slightly superior tone he uses when he thinks his mum's barmy. Well, I don't care what other people think. I think it was a tenner wisely spent and I'm very happy with my hoard displayed as though it were a bunch of exotic blossoms in my favourite vase. Here's to the small victories and commonplace trophies that make our hearts sing! Honest, my first thoughts were they were like a vase of flowers. Bright and colorful and lifts the spirit.